Home > Archive by Category "Corfu Sightseeing"
route was actually a magical journey to another era: back when the wild nature would show its dominance by creating the most amazing landscapes. That summer morning in the middle of July, I suggested to my friend who had come for holiday in Corfu, to show her the secrets of my island. I feel so lucky to have chosen studying here, but the truth is that I never had the chance to explore the whole island myself. The walk down the beach of Porto Timoni was the ideal opportunity. We drove ‘till the end of the Village of Afionas, located in the northwest side of Corfu, of course using our GPS. The whole route drove us crazy; the road was narrow, full of holes and dangerous turns. However, we didn’t in the least bit regretted it. The view from our windows was magnificent; tall firs, cypresses and age-long olive trees. We could feel the sea breeze and a scent of wild aromatic herbs was all around us. A wild, virgin landscape was waiting for us to explore it. By the time we had reached the verdant peninsula which separates the St. George from Arillas bay, the hot was unbearable. We sat at the wooden benches, without telling a word to each other. Our only desire was to let the wild wind blow between our hair, let us feel free to discover the next steps of our adventure. We walked towards the small square of Afionas village and took a small path, passing by the small stone houses with terracotta roofs. 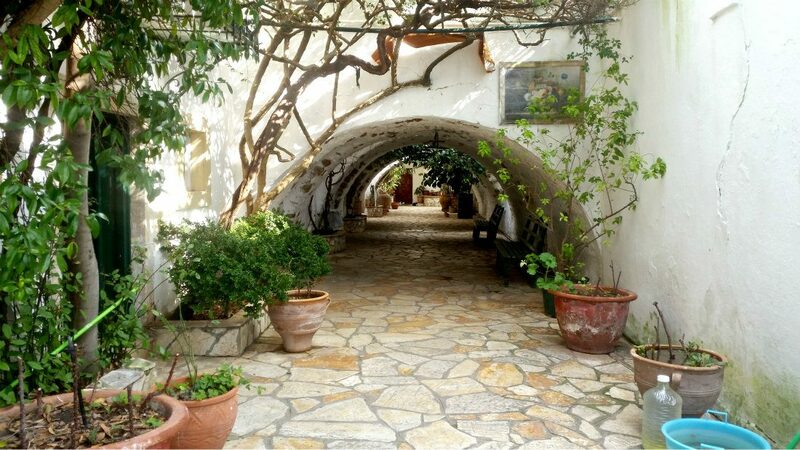 The path ended near a traditional taverna with a wonderful terrace full of flowers; and that’s when our real adventure begun. The trail wandered down the headland but Porto Timoni was barely visible at that point. This walk lasts about 20-25 minutes but is very challenging. Sometimes we needed to take an extremely large step to go down the next level. Also the path was really narrow and we would help each other on the way down. Fortunately, we had plenty of water and food with us because we knew that it is worth staying at Porto Timoni sunset. thought that a fortification was constructed in 300 BC. At the end of the route, the glorious beach of Porto Timoni was revealed behind the olive trees. Its crystal clear waters offered a wonderful view and a chance for snorkelling. We stayed in the water for hours, enjoying the sound of waves and the sun. 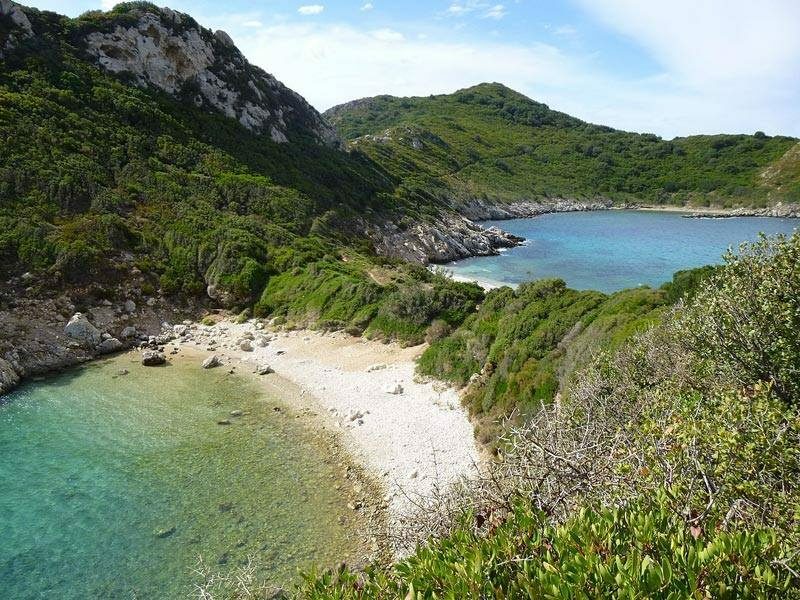 A remarkable fact we noticed, is that each beach in Porto Timoni has different temperature; the first has cooler water while the waters of Limni, the second beach are crystal green and warmer. Both beaches are shallow and with pebbles. We took thousands of photos to remember this unforgettable experience and after the sunset it was time to go back. We chose to return by boat, to feel for one last time the salty waves crushing on our bodies and the sound of gulls, as we were leaving Porto Timoni, staring at this miracle of nature with awe. Today, Achillion is a museum, permitting each and every one of us to have a small taste of the glory of that period. Passing through the main entrance, I was mesmerized by the greatness of the place, and I could only imagine what was next. On the left and on the right there are rooms used either as secondary rooms, or as rooms for pray. Straight ahead there is a pair of stairs in red carpet, and a mirror. And the magic of the place doesn’t stop here…I lift my head up and what I see is a ceiling full of beautiful murals of dancing muses and a painting in the middle (yes! There is a painting on the celling). When I climbed up the stairs I saw the most magnificent painting I ever laid eyes on. Achilles on his chariot, taming his horses. In front, I saw the royal gardens, they were full of statues of Ancient Greek philosophers, and people that contributed to science and history, and of course the muses that were the source of inspiration for every artist of that period. But shortly after that what I felt was sorrow and the weird sensation of the inevitable. 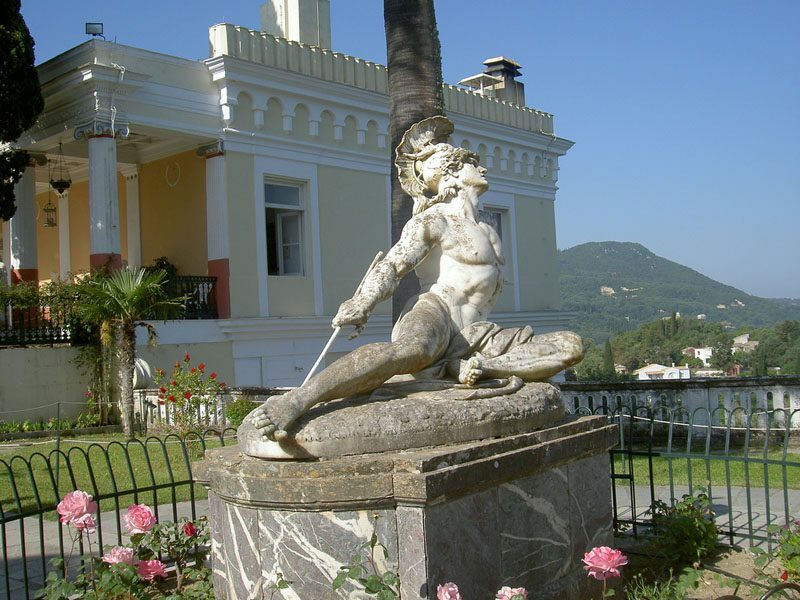 Achilles, fallen down, beaten by an arrow on his only weak spot, his as known “Achilles heel”. This second statue provokes the visitor to think. Not only a man that was once unbeatable now is fallen dawn, but also he has fallen by something so small like an arrow on his heel. “What if no one is unbeatable in this life we live?”, again the voice of my dad, and tears started from my eyes.